Here's a very organized bluebird perched atop an antique oil can! 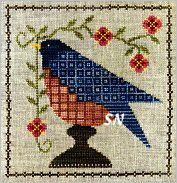 Stitched on Weeks Dye Works Putty Linen with Sampler Threads, this finishes approx 6-1/2 inches in size on 30ct linen. The geometric patterns in the bird really stand out. Well that about sums it up for some of you out there! We don't get much of it in OK... could you send some our way? Artful Offerings's new design is worked on Smokey Pearl linen with Weeks hand-dyed flosses. It finishes approx 6 x 9 on 28ct. The chart includes DMC conversions and pillow finishing instructions. It is only January... so there is time to finish this THIS snowy season! Oh gosh, isn't this little guy cute??? He's peeking out of the greenery just to make sure you are there!!! 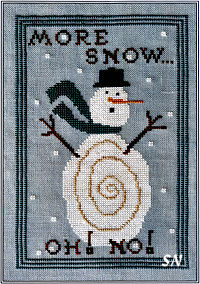 Choose a wintry blue/gray fabric (Smokey Pearl, Star Sapphire, Misty Blue) he finishes approx 5 x 6 on 28ct. Coded for DMC floss, HE does feature Gentle Art Simply Wool if you want to make him look fuzzy and warm. Presented as a chart. Here is a trio of new charted designs that just make me smile! 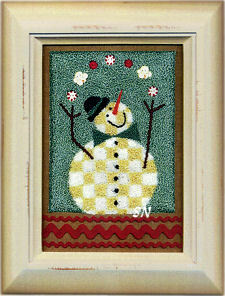 Sprightly Snowman -- How cute is this little guy!? 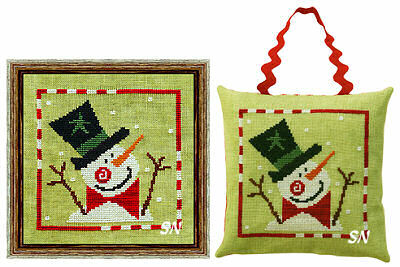 Stitched on Weeks Guacamole Linen he measures about 4-1/2 inches square and uses just 6 colors of Weeks flosses. Might be cute to add metallics or a sticky-outey carrot nose! SHHH... 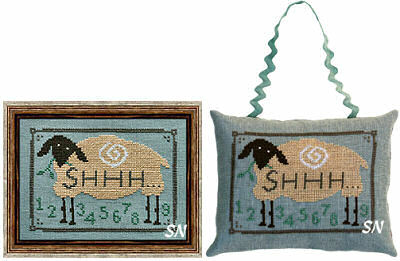 Counting Sheep -- Real cute for a new nursery! I'd try the Gentle Art Simply wool to stitch him -- he's just charted for regular flosses right now. It is a hand-dyed wool thread that has soft variations in it, and it would make him so fuzzy looking! Fabric color is Smokey Pearl -- to look like a soft evening... but you could change that to match the room if need be... and make the numbers coordinate. SHHH finishes approx 6 x 4 on 28ct. 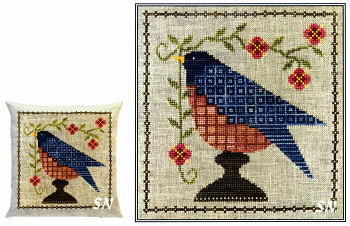 Regal Rabbit -- Another charming design -- I picture this as a pillow on a guest bedroom bed! Stitched on Weeks Avocado linen, she finishes approx 7 x 5, and is worked with hand-dyed flosses. The 'dots' in the background are a mixture of Lilac and Periwinkle... just as sweet as can be! This is just a cute design to make you smile! 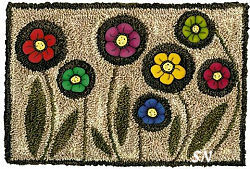 By Artful Offerings, it is stitched on Week's Havana linen (several counts available, on 30ct this finishes about 6 x 7) and calls for Sampler Threads or DMC. 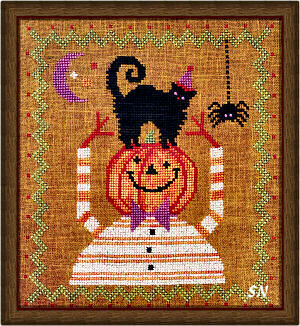 You could stitch the kitty in fuzzy black threads -- we have several options, you could add glass beads for the spider and cat eyes -- you could do the moon, bow tie and kitty hat in Fyre Werks metallic... you could bead the border... or add a couple more rows of a complimenting color to make it more jaggedy! Lots of options with this, because it has 'good bones!' Presented as a chart. 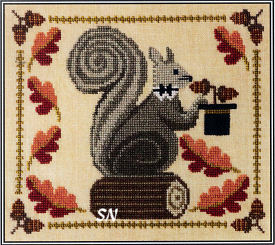 A banquet of Acorns stashed away in this little guy's very best top hat... isn't he spiffy and cute? 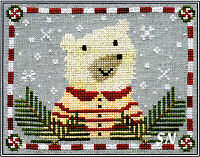 Stitched on Weeks 32ct Parchment linen this finishes approx 7-1/2 x 6-1/2, and is coded for DMC floss. You might want to grab a few of the hand-dyeds from your stash too... just for fun! Presented as a chart, you could add some Just Another Button Company acorn buttons to the border, or maybe some leaves! Artful Offerings has a pair of new charts that caught my eye! Two wintery-souls, each is surrounded by a bit of greenery -- like a little wreath. 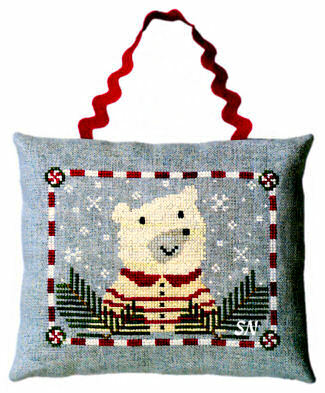 Stitched on neutral fabrics, they call for either Gentle Art Sampler Threads or DMC floss, and finish into generous-sized 4 x 5 ornaments. 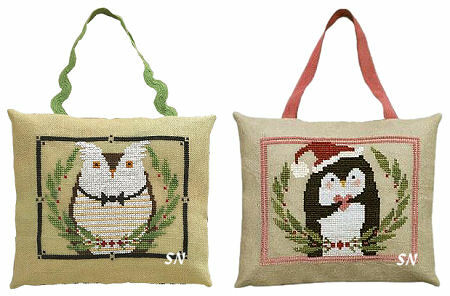 No special stitches or anything... just super-cute designs!